$100,000 price reduction on this 50′ Prestige 2014 for sale! - Atlantic Yacht & Ship, Inc. : Atlantic Yacht & Ship, Inc.
Word just came in from Chris Carroll that he has listed a great deal on an used 50′ Prestige 2014 yacht for sale! In the first place, this used 50′ Prestige 2014 yacht is new to the market. In addition, she has been professionally maintained by a professional captain since her launch in 2014. 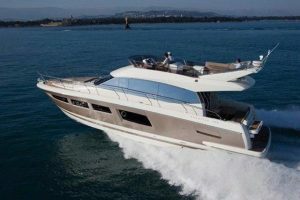 Similarly, with how hours on her desirable Volvo IPS 600 engines this yacht is turn key and ready to go! Moreover, with the IPS drive system, you get joy stick maneuverability so you are always easily in control when docking. This will come in double convenient as there is a stern control station as well. Furthermore, the engine warranty will cover you through the end of April 2020! This beautiful used 50′ Prestige 2014 has a spacious layout that even has a separate crew quarters. In a word, this yacht is loaded with options. An example of these options is the beautiful underwater lights and a WiFi extender. Another significant feature is the full array of Ray Marine electronics at both helm stations. For more information on this used 50′ Prestige 2014 yacht for sale be sure to contact Chris Carroll today!